5 Yelp Stars! My Little Flower Shop is the best Palm Springs florist! We’re rockin’ and rollin’ folks! A solid 5 star Yelp! rating thanks to reviews from our AMAZING customers telling the world that our service and floral design makes them happy. Which is our ultimate goal- happiness and love in the world. We’re not saying My Little Flower Shop is the best Palm Springs florist because … Read more5 Yelp Stars! 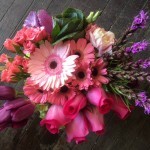 My Little Flower Shop is the best Palm Springs florist!